Emerald cut diamonds are known to be one of the very first diamond cuts that came into existence. This fancy cut has a pretty rich history that dates back well over 300 years, but it was only standardised in 1940 in cue is other diamond. As the name suggest, this cut was originally developed for cutting emeralds. However, it was quickly discovered that the cut looked even more enigmatic with diamonds. This cut is perfect to flaunt the beauty of coloured gemstones as well as high-quality diamonds. Emerald cut specifically emphasis the colour of gemstones and diamonds, so it is recommended to have a higher colour grade diamonds. Also known as "step cut" because of the layered and mirror faceting that looks like steps, the emerald cut possesses a unique appeal with symmetrical proportions and soft but pristine sparkle. Unlike the brilliant cuts, emerald cuts have less fire and sparkle because its faceting is minimal and simple, and therefore tends to show inclusions. The diamond has 58 facets, roughly 25 on the crown, 25 on the pavilion, and 8 on the girdle with 3 rows of bottom steps and 3 rows of top steps. But the unique step cut allows the diamond surface look bigger than other brilliant cuts because of its wider spread and lesser depth. THE BEGINNING: Emeralds have an exceptionally rich history that dates back 300 year and distinguishes them from other cuts. This is one of the primitive cuts invented. The word “emerald” is derived from the ancient Greek word “green”. As the name suggest, it was originally developed for cutting emeralds. This gemstone has more flaws and inclusions than diamonds and other gemstones like ruby and sapphire. It was precisely to overcome these flaws that the cut was invented. But it was soondiscovered that the cut looked even more charismatic on diamonds because of its elegant and classy appeal. This cut evolved over time when improvements were brought about to the point cut. By 15th century with better tools point cut improved immensely. Popular table cut was created and importance of culet was realised. With advanced techniques deep clean lines and symmetrical facets brought about the real change.As oppose to brilliant cuts that have kite or star like faceting, emerald cut have steps that exudes luminescence and charisma quite unlike the brilliant cuts. This characteristic step cuts plays with light to create hall of mirror effect. The exquisite long facets and bevelled corners showcase dramatic flashes of light and highlight the subtle lustre and pristine clarity of the diamond or the gemstone. Because of these cut diamond is more transparent than other shapes, resulting in the need for higher clarity grades. Inclusion can be clearly seen even without magnification. POPULARITY: Though the origins can be traced back hundreds of years ago, emerald cut gained popularity only in 1920’s with the advent of Art Deco Era which venerated the symmetry, clean lines and timeless elegance of the emerald cut. The rectangular cut, which has a relatively larger open table and fewer facets, highlights the clarity of the diamond more than any other shape. Emerald cut diamonds produce a hall-of-mirrors effect, with the interplay of light and dark planes.The refined step cut of emerald cut diamonds lends a neat, sophisticated air to both the simplest and most elaborate ring setting. It is because of this finesse that the popularity of an emerald cut diamond has only increased ever since. Even celebrities like Angelina Jolie, Demi Moore, Eva Langoria, Beyonce, and Mariah Carey have been spotted adorning emerald cut diamond on the red carpet. RATIO: The ideal length to width ratio of 1.25 to 1.5 is recommended for this type of cut. SETTING: Emerald cut looks best with prong setting in a solitaire diamond ring or pendant. However its elongated, versatile shape allows it to look equally stunning in other setting that would enhance the elegance. Emerald cut diamond look absolutely beautiful when crafted in rings. However, halo setting with small accent stone tend to dwindle the classiness of an emerald cut diamond. Halo setting generally look good on stones with curved edges. But an emerald cut diamond ring with fine metal filigree in a halo setting around the diamond adds an alluring vintage appearance. Another popular setting is three stone emerald cut diamond ring. As the name suggest, this ring has emerald cut diamond as centre stone nestled between two stone that perfectly complement the emerald cut diamond. This style not only give a classic vintage feel to it but also has symbolic importance. Those who are spiritually inclined will find that a three stone diamond engagement ring of more significance. Often referred to as trinity or trilogy rings, they have represent: The past, present, and future of your relationship. When emerald cut stones especially look grand when paired with Trillion shaped diamond. Also one big centre stone and two accenting emerald cut diamonds look simple alluring with a regal grandeur. PRICING:Emerald cut diamonds varies from nearly square to rectangle in shape and length. Like other princess cut and cushion cut, emerald cut too preserves weight and has a lot less wastage. This is one of the reason why they are priced lower. However, a compromise is that because of their depth, the carat weight is concentrated at the centre, making emerald cut diamonds look visually smaller. They are a popular choice among budget-conscious buyers seeking an economical alternative to pricier round or princess cuts. However an excellent grade emerald cut is priced at equal premium as cushion and princess. - Diamond’s ratio and clarity: An ideal ration for square emerald cut diamond should be in between 1.00 to 1.05. Talking about rectangular emerald cut diamonds the ratios should rangebetween 1.35, 1.50 and 1.75. The ratio is determined by dividing length by width. 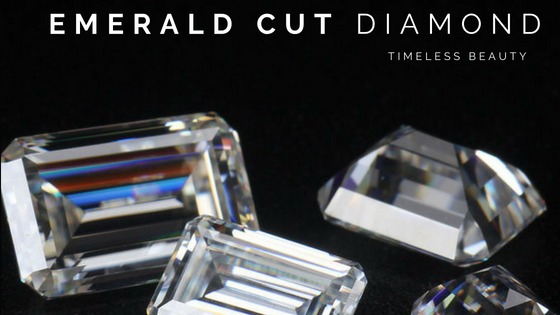 - Because of the open table and clean simple facets, emerald cut tends to show off inclusions more than any other cut, so a higher clarity grade is recommended. Or one can also consider VS2 with inclusion that are off centre and towards the girdle so that it can be masked by the setting. - Just like clarity, emerald cut also highlights the colour. For fancy coloured diamond emerald cut is the best cut to showcase the luminescence of coloured diamonds. - Best way to determine diamond price rate variation is to see price per carat rate. Unlike round diamonds whose price per carat rate increases exponentially with increase in the carat weight, that of emerald cut remains quite consistent making it more cost efficient for the buyers. - The price of diamonds in same carat size category may vary depending on whether you buy your jewellery or diamond engagement ring online or in-store.